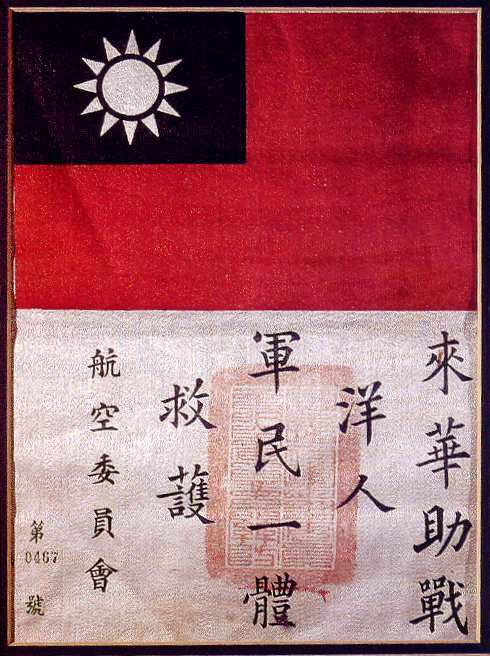 The Flying Tigers' "blood chit"
The five smaller characters to the left of the main text indicates that the chit was issued by the Commission for Aeronautical Affairs of the Chinese Nationalist government. The two above and below the serial number mean just that: di hao = number. "I maintain that there were two major printings of AVG chits with some slight material differences possible. AVG chits "always" have the red stamp from the Nationalist goverment's Commission for Aeronautical Affairs centered (or close) on the white field in the middle of the writing, no exceptions. Later chits have them on the left side. "I believe a second printing was done with the addition of 1 more small Chinese character above the number. I believe this printing in anticipation of the SAVG (Second AVG) numbered into the two thousands, most likely since this was to include bombers and crews. Chennault kept or held back the first 200 [blood chits] including #0001 which went on his jacket. I know for a fact that the first 200 were brought back to the states by him. In the early 60's they were donated by his widow to the 14th A.F. Association and sold to raise funds for them at $60.00 each. These are the most common of AVG chits to come across, if you can call any of them common. "Many AVG members seemed to have also been issued these chits but all were over #200. There must have been a number left over as they were issued also to the early members of The China Air Task Force and beyond, most likely until supplies were exhausted. I have one in the 2000's that is the second printing. All chits I have seen come from AVG members or are still held by them fall into one of these two categories." Posted February 2016. Websites © 1997-2016 Daniel Ford; all rights reserved.